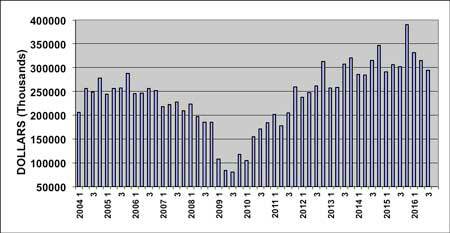 North American shipments of plastics machinery registered a year-over-year decrease in the third quarter of 2016 according to statistics compiled and reported by the Plastics Industry Association’s (PLASTICS) Committee on Equipment Statistics (CES). This was the first quarterly decline since the same period last year, and it was only the second time there was a quarterly decrease since the recovery started in 2010, according to PLASTICS, formerly SPI, which is the only organisation that supports the entire plastics supply chain, representing nearly one million workers in the US$418 billion US industry. The preliminary estimate for shipments of primary plastics equipment (injection moulding, extrusion, and blow moulding equipment) for reporting companies totalled US$294.7 million in the third quarter. This was 2.4% lower than the total of US$302 million from Q3 of 2015, and it was 6.5% less than the US$315.3 million from Q2 of 2016. For the year to date, shipments of primary plastics equipment are still up 4.7% when compared with the first three quarters of 2015. “Shipments of plastics equipment rose steadily during the six year period from 2010 through 2015, but this trend hit a plateau in 2016. The quarterly comparison will be difficult in the fourth quarter of this year, so the annual growth rate will continue to moderate in the near-term. But the incentives to invest in new equipment remain strong, and if Congress passes some meaningful corporate tax reform in 2017, they may even improve.” according to Bill Wood, of Mountaintop Economics & Research, Inc. Wood is the plastics market economist who analyses and reports on the plastics machinery market for the CES. When this data is broken out by reporting sector there is typically some variance in the quarterly growth rates, and the third quarter was no exception. The shipments value of injection moulding machinery decreased 6.0 percent in Q3 of this year when compared with the total from Q3 of 2015. The shipments value of single-screw extruders decreased 3.8% in Q3 when compared with Q3 of 2015. The shipments value of twin-screw extruders (which includes both co-rotating and counter-rotating machines) jumped 27.6% in Q3 when compared with last year. The shipments value of blow moulding machines was not disclosed for this quarter. New bookings of auxiliary equipment for reporting companies totalled US$119.8 million dollars in Q3 of 2016. This represented a rise of 0.7% over the total from Q3 of 2015, but it was a drop of 3.0% when compared with the total from Q2 of this year. The moderate decline in the CES machinery data in Q3 was still better than the performance posted in the quarter for the entire industrial machinery industry. According to data compiled by the Census Bureau, the total value for new orders of US industrial machinery dropped 8.0% in Q3 of 2016 when compared with the total from Q3 of 2015. This followed a rise of 6.8% in the first half of this year. 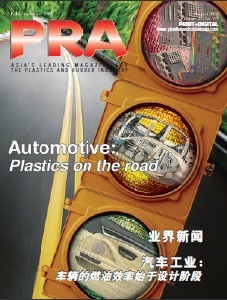 Another macro-indicator of demand for plastics machinery is compiled and reported by the Bureau of Economic Analysis (BEA) as part of the US GDP dataset. According to the BEA, business investment in industrial equipment increased 4.1%(seasonally-adjusted, annualized rate) in Q3 of 2016 when compared with Q3 of 2015. This followed a gain of 3% percent in the first half of this year. "Growth in the US GDP is gaining momentum in the second half of 2016, and the improving economic fundamentals bode well for consumer spending in the coming year. I still expect consumer demand for plastics products to increase at a sustainable pace in the coming months. Our forecast for the economy in 2017 calls for annual, real GDP growth in the range of 3% due primarily to steady improvement in wages and household incomes resulting from stronger employment levels," said Wood. 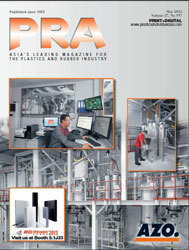 The CES also conducts a quarterly survey of plastics machinery suppliers that asks about expectations for the future. 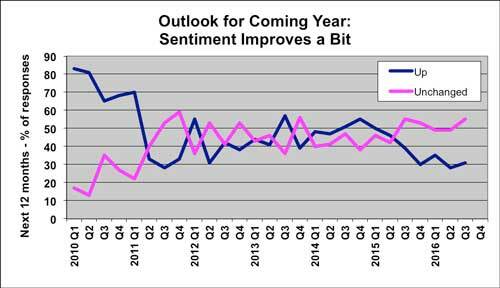 According to the Q3 survey, 86% of respondents expect market conditions to either hold steady or get better during the next year. This is up from 77% in the previous quarter. The outlook for global market conditions also improved in the third quarter. Mexico was the region with the strongest expectations for improvement in the coming year. North America and Europe are expected to be steady-to-better. The outlooks for Asia and Latin America are more optimistic than they were last quarter, but the majority still expects that conditions will hold mostly steady. The respondents to the Q3 survey expect that medical and packaging are the end-markets that will enjoy the best growth in demand for plastics products and equipment in the coming year. The expectations for the construction and appliances improved. Automotive expectations slipped. Expectations for all other end-markets call for steady-to-better demand to prevail in 2017.